I don’t think it’s any secret, in this online world, that just about everyone is trying to make a little bit of money with a website. After all, it’s not terribly difficult. It’s not necessarily easy, but it is far from hard. Throw up a website, put some work into it, and start bringing in money. I do it with this site and others. There’s work involved, but you can make money. If you’re going to do it, you’ve got to treat it like a business from the start. I don’t mean that you have to create a company, license it with your state and the IRS, and create a board of directors. What I do mean, is that you need to have the business assets and accounting separate from your personal assets and accounting. Using your own personal checking account, savings account, and trying to keep them separate come tax time (and you’ll want to) can be very difficult. So difficult that you almost have to be a CPA in order to keep it all straight. When I first began making money with blogs and websites, I didn’t separate anything. The money to buy the domains came directly from my personal checking account. The money to pay for the hosting of the websites came directly from my personal checking account. And then tax season came around. While I hadn’t made much money from the sites, I did make some. I wanted to be able to use the expenses of the sites to reduce the income from the sites, so I needed to figure all of that out and get totals for my taxes. Instead of just going into my accounting software, pulling up the business accounts, and running a profit loss statement, I had to go through each months’ statement of my checking account, and single out the transactions that were related to the sites. After I’d pulled them all out, I had to compile them into a spreadsheet and create a profit loss statement from them. It easily took twice as long as it should have. And that was when things were simple and I only had a couple of sites with a couple of transactions every other month or so. It would be much more difficult now. How should you separate your business accounts? I’m still a fan of keeping things as simple as you can. I don’t think you need to go through the whole filing process to create a company. That’s something that can wait until you’re making a decent amount of money. Ask your CPA if you want a more accurate number. You can keep it simple. 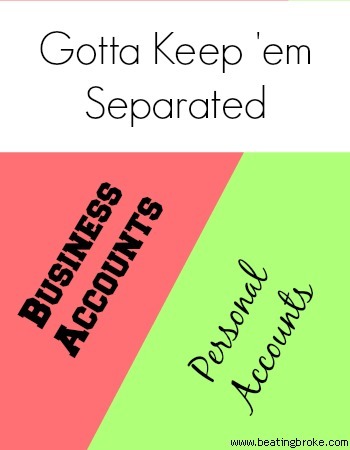 What you really need is separate accounts and separate bookkeeping. Start with setting up separate accounts for the business funds to flow into. You’ll need your own business savings account. Add a checking too if you think you’ll have need of a debit card or actual checks to write out. I’ve got a checking account and several savings accounts set up that are used solely for the business funds. If you’re not going to use the business account debit card for online purchases (it’s probably safer not to), you’ll also want a credit card that is used only for business transactions. Again, it doesn’t have to be in the business’ name, it just has to only be used for business use. I use one that has a 1-5% cash back feature to save a little extra on expenses. When it comes to keeping your books, you probably don’t need anything too fancy for your personal accounts. Just enough to create your budget, and keep track of accounts. For business, you really need something a little bit more. I prefer a full on business accounting software. There’s a couple out there, and you can probably pick one up cheap off of eBay. They’re a little more complex than the software created for personal accounts, but I like the detail the complexity gives me. Maybe you can get by with a robust spreadsheet. But, something that you can use to give your CPA (even if that’s you) a full detail of the profit/loss of the company including all sources of income and expenses. It may sound a little difficult, but it’s not any more difficult that it would be if you didn’t separate them first and then tried to separate them after you need to. You’ll thank yourself later. I wonder if you could give me a little advice. We are starting to make a little money off of our blog but we don’t yet know if we should open a business savings account. At what point (revenue wise) would you suggest we do? Thanks for this post, it is hopefully going to become really relevant for us very soon. @Jon, I think that depends. I think it’s easy enough to get a separate account to put the business income into that you really should at least have a separate account right away. Sign up for a Capital One 360 account and use that. If you’re asking when you need to get a business license and all that, it really depends on your personal income and the income of the sites. I’ve been blogging as a money making hobby for over 8 years and I still haven’t taken that step yet. Thanks so much, we will definitely get that business account opened. Sounds like we probably won’t have to worry about applying for a business license anytime soon. We are growing but not that fast. Thanks for the practical tips. I’ve been using my personal checking/savings to finance my site. I’ve been keeping a separate spreadsheet though for business costs. It would probably be easier to just open a separate account. I am in the market for some business accounting software. Do you mean that people sell it used on eBay? What kind of software can you find there? I’d love to find a way around paying full price for it. @Amanda, usually, they’re new copies of slightly older versions. I’ve picked up copies, at one time or another, of both Quickbooks and Sage on eBay for a significant discount from the retail price. You just might have to be comfortable with having a version that’s a year or two old. Great advice. Definitely want to track your finances separately, even if you haven’t formed a separate business entity yet. When I started my first business, even as a sole proprietor, the first thing I did was open a separate checking account, and get a new credit card. Even though they were still personal accounts, not business accounts (e.g. using my own tax id, not a separate business tax id) it made the book keeping much much easier. As for software, I’d start with Mint, since it’s online, easy, and free. If you grow large enough to outgrow Mint, Quickbooks is the de facto small business accounting program. It’s expensive, but if you need it, it’s invaluable. Frankly, by the time you need Quickbooks, you may be better off just getting a part time book keeper to track it all for you. Personally, I’d rather invest my time in growing my business than in tracking every penny to balance the books.